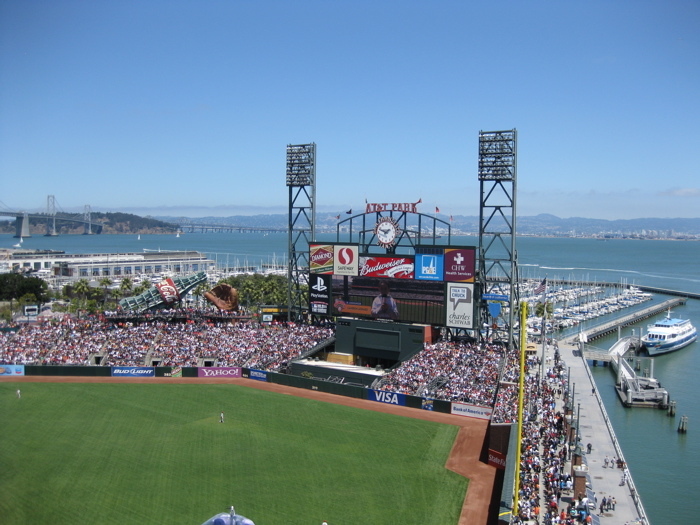 The main event on the schedule for Day 4 was to take in a Giants day game at AT&T park. But first we figured we should grab some lunch at Santa Ramen. This is the ramen place with rich pork broth similar to that of Ippudo Ramen in NY. The main thing I remembered from last year was that their special premium pork was outstanding. This time around though, it wasn’t quite as fatty and therefore not quite as good. It was still a thoroughly satisfying bowl of noodles, just not as good as the one I had a year ago. The whole place just has a friendly and inviting vibe. I also liked their variety of concession stands and that I could enjoy a Guinness while watching baseball! After the game came another big moment in the trip for me- my virgin visit to a Philz Coffee. This one was located a few blocks from the ball park. As we walked in, there was a lot of activity going on as they were apparently training a team of new employees and one guy behind the counter flagged me down and insisted I try a special coffee drink he had just made. I tasted it and it was fantastic. It turns out it was their iced mint mojito. I don’t usually go for coffee drinks with too much milk or cream, in fact I usually take my coffee just black with sugar, but in this you could still really taste the coffee and the accent of the fresh mint added a nice freshness. Intrigued, I read through the entire list of descriptions of their dark roast selections to figure out what I was going to order. I decided upon the Julie’s Ultimate blend. The process at Philz is kind of cool. The barista took my order, asked how I like it and I told him black and medium sweet. He turned to the vats of beans behind him, scooped some out of the appropriate bin, ran them thru a grinder, then placed the grinds into a coffee filter atop an empty pitcher. Then he poured some hot but not boiling water over the grinds and took a spoon and stirred everything in the filter. Upon dripping through, he then poured the coffee back and forth from cup to cup (to aerate the coffee?) and then presented it to me saying “try that for me and let me know if it’s how you like it”. Nice. Total elapsed time was probably about 5 minutes for this single cup of coffee. I picked it up and took a sip… and I will never be the same. It was perfect. It tasted like great dark roast coffee, but somehow more refined and balanced. Perfect amount of sugar, just enough to enhance but not overwhelm the flavor of the coffee. And best of all, there was no bitter finish. Zero. None. For as long as I can remember, coffee that is rich and dark has always come with a downside- a bit of astringency and bitterness on the finish. 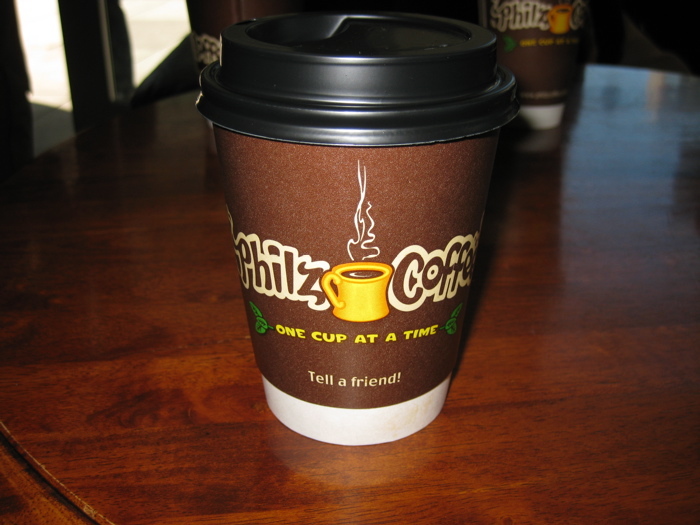 Not so with Philz. Not sure if it’s better beans or better coffee making technique, but whatever it is, it’s magical. I was, and still am, thoroughly impressed with this place.